Cap toe bootie with inside zipper. Strap and buckle ornamentation. 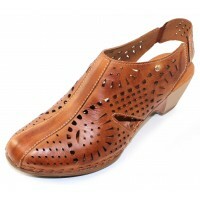 Leather padded insole. Rubber sole. 2 inch stacked heel.